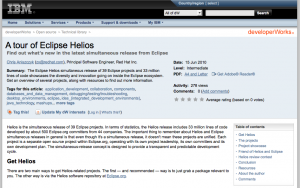 My article about the Eclipse Helios release finally went live today at developerWorks. Thanks for the Eclipse.org project leads and committers out there that took the time to send screenshots and quotes. Also, while you’re at it, why not consider becoming a Friend of Helios and Eclipse to support Eclipse development!